Santa and Frosty know this address by heart (click on pix for album). This Christmas Duo has been visiting Aunt Irene for years. Originally her children, grandchildren gathered to hear the wonderful story of Christmas on the Saturday before Christmas. Now the children, grandchildren and even the great grandchildren of her butcher, baker, candlestick maker, vet, Doctor, banker teller and more, gather. 'Twas the night before Christmas is read aloud and then Frosty dances followed by the Jell-O King himself Santa. He listens to all children taking their lists and checking them twice. 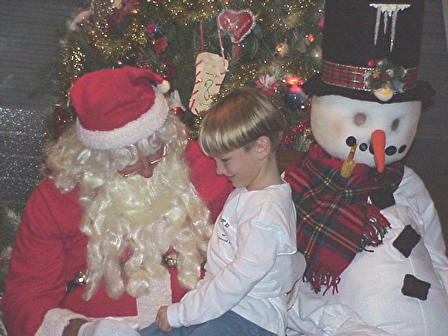 Thanks Santa and Frosty for coming again to Nonna's house in the heart of Dolphin country.